A brilliant paean to love, directed by Richard Curtis, the writer of "Four Weddings and a Funeral." The ensemble features many of Britain's finest actors, and Grant is certainly no slouch as the Prime Minister, in love with the girl who brings him his tea. The film that made him famous and the character that he has often repeated, almost always delightfully. 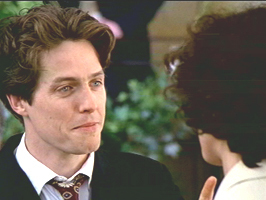 If Hugh Grant isn't as stammering, modest, unsure and shy as he is in most of his films and in his famous "Tonight Show" apology for messing around with a prostitute, then he sure is putting on a great act. Charm. 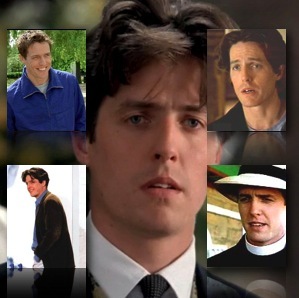 Hugh Grant combines the practiced manners and lovely diction of the British upper class (he was educated at Oxford) with the endearing self-effacing and truly modest qualities of, well, not the British upper class anyway. Though he has classic good looks, it is not the looks that win the ladies in his many romantic comedies. It is the softly fumbling shyness; it is the surprising quality of seeming uncomfortable in his own skin, manifested in a wide variety of bits and quirks, but which translate to charming and sensitive. Probably more than any other actor. In fact, they are so ingrained into Grant's performance that to mention them individually is to miss the point. His stable of bits and quirks is what conveys his essence, his sensitivity, his befuddled humanity. Every part of his face has a roster of moves that can be combined with any other: raised eyebrows and slightly closed eyes; lowered eyebrows and overdone contemplative frown; then, a touch to the brow or to the mouth or a scratch of the head, and it's a different hue of Hugh. > Staying up all night to re-measure the hill/mountain.